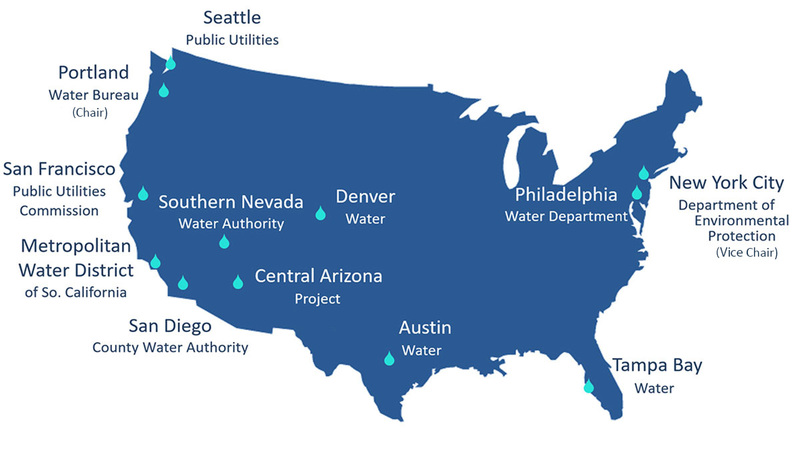 The Water Utility Climate Alliance (WUCA) comprises 12 of the nation's largest water providers. WUCA members supply drinking water for more than 50 million people throughout the United States. 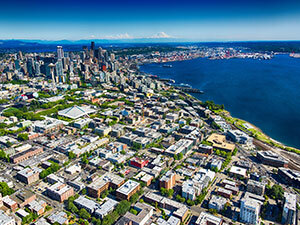 Seattle Public Utilities provides drinking water, drainage, sewer and solid waste services. Top climate concern(s): Decreased snowpack and associated changes in hydrology reducing drinking water supply, changing the frequency and intensity of precipitation patterns, and the combined impacts of increased precipitation and sea level rise on urban flooding. Where appropriate, using nature-based solutions. Austin Water provides services for drinking water, wastewater, reclaimed water, wildlands protection, and water for firefighting. Drought: The City's water supply comes from surface water reservoirs on the Colorado River, known as the Highland Lakes (Lakes Travis and Buchanan). During the recent drought (2008-2015) the combined storage in the reservoirs reached 32 percent, the second lowest level ever. Regional climate models indicate that although annual average precipitation amounts may not change significantly in the future, there may be longer dry periods and more intense precipitation events. Heat: Regional climate models also indicate more days of excessive heat in the summer months. During 2011, the worst year of the recent drought, Austin experienced more than 90 days of temperatures above 100 degrees. Increased heat means increased evaporation of the lakes, and in 2011 the city saw an approximate 25 percent increase in recent average evaporation. Heat may affect water quality, can result in power grid outages that impact operations and can also impact machinery and personnel. Flooding: Austin has experienced several severe flooding events in recent years. Extreme rainfall events can cause damage to critical facilities, including overwhelming wastewater treatments plants, resulting in partially treated effluent being released. Flooding can also result in increased inflow and infiltration into sanitary sewer systems, resulting in overflows. The drought and flood cycle has occurred throughout much of Central Texas history, including the 2008-2015 drought, which was broken by heavy rains and flooding. This pattern could intensify with climate change. 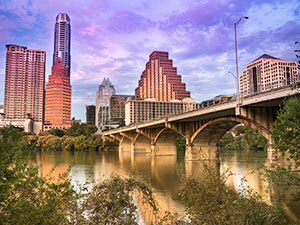 Austin Water (AW) takes on climate change through planning, conservation and greenhouse gas reduction. AW began tracking greenhouse gas emissions after the 2007 adoption of the Austin Climate Protection Plan. Operational changes and capital improvements – including the installation of an onsite 850 KW biogas-fueled generation unit – improve energy efficiency. The unit provides enough electricity to power AW’s Hornsby Bend Biosolids Management Facility. AW also installed a solar roof on one of its large service centers. In 2007, Austin Water began strengthening its conservation programs, deploying an array of strategies including mandatory year-round watering restrictions, best-practice water conservation programs and the expansion of reclaimed water infrastructure. Its subsequent Drought Contingency Plan put in place even stronger measures, including a one-day-per-week limit on outdoor watering for automatic irrigation systems, the least efficient type of irrigation. The City Council created a task force in 2014 to support development of an Integrated Water Resource Plan for Austin. This effort grew into Water Forward, a multi-year, collaborative planning process led by Austin Water to address the city's water requirements 100 years into the future. This effort includes evaluation of potential climate change impacts on Austin’s water supply and water demand. 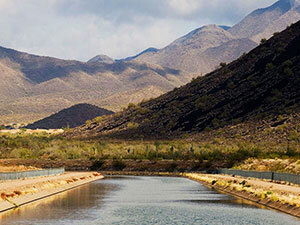 The Central Arizona Project provides water to a variety of customers for different uses: municipal and industrial users (including cities); agricultural users; Native American tribes; and water for underground storage. How the utility is addressing climate change: The Colorado River Basin generates CAP's water supply, so warmer and drier conditions caused by prolonged, climate-change induced drought in the watershed - with reduced snowpack and streamflow - is a major challenge that requires active management. Increased warming in the CAP service area also results in inflated water demand from customers, and extreme weather events such as flooding negatively impact CAP's water infrastructure. To minimize the impact of potential water shortage on Central Arizona, CAP has undertaken numerous adaptation strategies, including collaborative water conservation programs, underground water banking and storage for future use, and water augmentation activities such as weather modification and desalination projects. An organizational climate adaptation plan is currently under development as well. 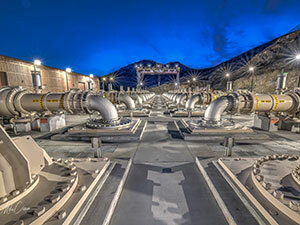 Denver Water is responsible for the collection, storage, quality control and distribution of drinking and recycled water, serving 25 percent of the state's population and using less than 2 percent of all water consumed in Colorado. Top climate concern(s): The amount and longevity of Rocky Mountain annual snowpack and accompanying impacts to streamflow; less productive wet years and enhanced, extended, and more frequent multi-year droughts; watershed and water quality impacts due to forest fires, pest infestation, warming-induced vegetation changes and warmer water temperatures. 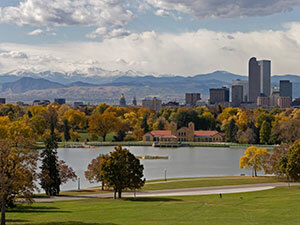 How the utility is addressing climate change: Denver Water's approach to climate adaptation embraces the complexities of Colorado's climate, while applying practical strategies to sustain climate resilience. The state is situated mid-continent and mid-latitude, in a complex orographic setting. Highly variable historic weather patterns make trends difficult to identify and climate change projections challenging to navigate. Colorado is warming, the natural system is changing, and preparing for a hotter climate is fundamental for a sustainable future. co-producing new science, practices and decision-making approaches to better prepare practitioners for an uncertain future. Recognizing that climate science is informative but not predictive, Denver Water was one of the first utilities to change the its long-range planning process by adopting Scenario Planning to prepare for multiple futures. Moving forward, the plan will be enhanced by testing and hedging it against dozens of potential uncertainties using a Robust Decision-making process. 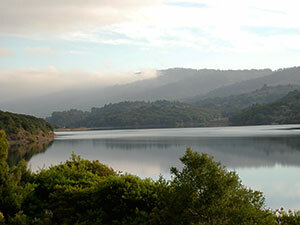 The Metropolitan Water District of Southern California is a wholesaler of treated and untreated drinking water. Metropolitan also is responsible for distribution, and helps member agencies develop water recycling, storage and other local resource programs to provide additional supplies and conservation programs to reduce regional demands. Top climate concern(s): Loss of Sierra Nevada snowpack; reduction in runoff and river flow in the Colorado River Basin; rising sea levels. How the utility is addressing climate change: After more than two decades of integrating climate change science into its planning efforts, Metropolitan now monitors the direction of ever-changing impacts from improved global climate models that show the region's vulnerability to longer-term risks. Since 2004, Metropolitan's integrated water resource plans (IRPs) have moved the region towards comprehensive planning and adaptation for climate change impacts. The 2010 and 2015 IRP updates, however, moved to a new level, utilizing a robust decision making approach, which is a comprehensive, technical process that identifies key vulnerabilities associated with climate change and other sources of risk and uncertainty. In addition to its research and planning initiatives, Metropolitan is a leader in efforts to boost regional water use efficiency, from increasing the availability of incentives for local conservation and recycling projects to supporting conservation best management practices for industry and commercial businesses. pursuing development of "green" renewable water and energy programs. The New York City Department of Environmental Protection provides services for drinking water, wastewater, and stormwater. 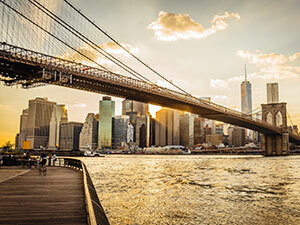 How the utility is addressing climate change: DEP has been preparing for the impacts of climate change for many years, working to incorporate resiliency in one of the most complex urban environments in the world. In 2008, DEP issued its first Climate Change Assessment and Action Plan, and it has continued to assess risk to infrastructure and operations while developing cost-effective and proactive responses to prepare for climate impacts. After Superstorm Sandy and Tropical Storms Irene and Lee, it became evident that some impacts not expected to manifest for decades are in fact possible today. Accordingly, DEP is implementing 'no regret' or cost-effective solutions based on what is known to work today while continuing to assess risks and develop tailored solutions for more complex and uncertain issues. Water supply efficiency, operational intelligence and infrastructure optimization are being employed to ensure that water supply systems continue to function without interruption from storms and droughts. Strategic flood protection measures are being implemented at wastewater treatment facilities that are at risk from storm surge and sea level rise. And, DEP is considering the city's risks from extreme rain events, seeking solutions to these events through integration of grey and green infrastructure solutions. The Philadelphia Water Department provides services for drinking water, wastewater and stormwater. Precipitation increases and extreme storms create more stormwater runoff which can negatively affect source water quality, stress the drainage system, increase flooding, and lead to more combined sewer overflows. Sea level rise coupled with extreme storms could increase coastal flooding, inundate critical PWD infrastructure and potentially impact drinking water quality. 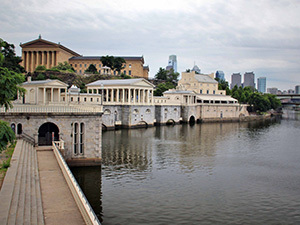 Increases in air temperature, which in turn raise the temperature of Philadelphia's source waters, can create challenges for the drinking water treatment process and impact aquatic life. How the utility is addressing climate change: PWD is committed to assessing risk and planning for the future to ensure high levels of service continue for current customers and future generations. In 2014 PWD created the Climate Change Adaptation Program (CCAP) to better understand the impacts that climate change will have on Philadelphia’s drinking water, wastewater and stormwater systems and to develop cost-effective adaptation strategies to minimize those impacts. The CCAP stays up-to-date on the latest climate science and collaborates with other city departments, regional partners, stakeholders, researchers and peer water utility networks to address this challenge. The program is currently undergoing a comprehensive risk assessment to better understand the complex vulnerabilities to climate impacts across PWD systems. A main goal of the CCAP is to make climate change science and risk assessment results actionable in the context of PWD planning, design and engineering applications. To increase resiliency, the CCAP is exploring approaches to apply climate change information to existing programs and long-term plans, major investments and operational and design standards. The Portland Water Bureau provides drinking water (retail and wholesale); primary unfiltered surface water supply and secondary groundwater supply; water efficiency support for residential and business customers; and low-income customer programs. Top climate concern(s): Earlier or longer seasonal reservoir drawdown due to loss of snowpack and changing precipitation patterns; higher risk of turbidity events due to more frequent or intense rain storms; increasing water temperature impacts to endangered fish and drinking water quality. How the utility is addressing climate change: Collaborating with leading regional climate scientists, the Portland Water Bureau (PWB) has been assessing climate impacts to Portland's drinking water system for 20 years. More recently, PWB developed customized modeling and analytical tools for long-term planning purposes. The Bureau continues to build internal expertise to conduct climate impact assessments, and its climate work benefits greatly from idea sharing and technical feedback from other WUCA utilities. 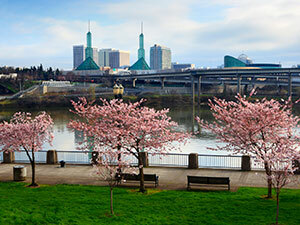 A recognized leader in local and regional climate planning and adaptation efforts, PWB has developed strategies to prepare for climate change as part of the City of Portland and Multnomah County's Climate Change Preparation Strategy. 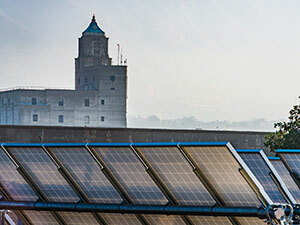 To meet Portland's Climate Action Plan goals, PWB implements actions including: calculating and reporting on carbon emissions, installing renewable energy facilities, purchasing renewable energy credits to offset electricity use, and improving the energy efficiency of pumps and buildings. 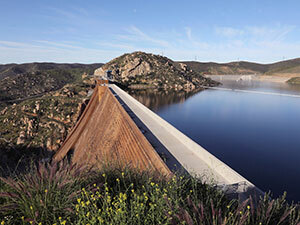 The San Diego County Water Authority is a wholesale drinking water provider. Support of member agency development of reliable recycled water supply projects. In 2014, the Water Authority also voluntarily prepared its first Climate Action Plan, which provides a comprehensive look at the agency's practices and operations and includes measures to reduce greenhouse-gas emissions. Through efforts to develop renewable energy (hydro and solar generation) and reduce fleet emissions, the Water Authority will meet and exceed reduction targets for 2020 and will offset its emissions well into the foreseeable future. Additionally, since the early-1990s, the Water Authority has promoted long-term water use efficiency through incentives for water-efficient products, offering water conservation technical services and education, and sponsoring legislation to strengthen indoor and outdoor efficiency standards. These efforts resulted in a 39 percent drop in San Diego County's per capita water use between 1990 and 2015, before state-mandated drought emergency regulations took effect. The San Francisco Public Utilities Commission provides drinking water, combined wastewater/stormwater collection and treatment, as well as hydropower generation. How the utility is addressing climate change: The SFPUC has a long history of engagement in local, regional and national forums that develop and promote best practices in assessing and addressing the potential impacts of climate change on water utilities. Within the utility, initiatives have included a sensitivity analysis of the effect of temperature and precipitation scenarios on water supply using a calibrated hydrologic model. As sea level rise is a source of significant vulnerability, the SFPUC led development of a city-wide "Guidance for Incorporating Climate Change into Capital Planning" in 2014. The utility also helps oversee vulnerability planning for city departments and participates in other SLR initiatives. examine climate change information from all sources to determine the likelihood of one or more climate futures. The Southern Nevada Water Authority is a not-for-profit wholesale drinking water provider. How the utility is addressing climate change: SNWA recognizes water supply and infrastructure challenges associated with drought in the Colorado River Basin could become a long-term reality with climate change. Consequently, SNWA has significantly invested in adaptation, implementing 'low regret' solutions to address today's challenges while increasing long-term climate resilience through water conservation, new facilities, long-term planning and climate change research. Between 2002 and 2016, SNWA's aggressive water conservation program reduced Colorado River consumptive use by 38 percent, despite the addition of more than 600,000 new residents. Current and planned development of new facilities – including a new water intake and low lake level pumping station – help safeguard water quality and ensure the community's access to its primary water supply in Lake Mead. SNWA also participates in the Colorado River System Conservation Pilot Program, which is bolstering reservoir levels and delaying federal shortage declarations. Long-term planning and continued research is a priority. SNWA's 50-year water resource plan considers a continuum of potential supply and demand conditions, including anticipated influences of climate change. The resource plan demonstrates how SNWA is able to meet a range of climate and demand scenarios. Finally, SNWA collaborates with climate scientists and other agencies to assess impacts to water supplies and facilities, and to adapt. 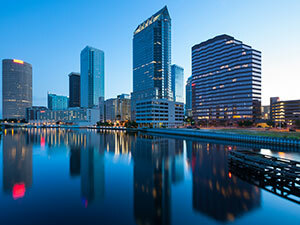 Tampa Bay Water is a wholesaler of treated and untreated drinking water. Tampa Bay Water is also responsible for distribution, and works with member agencies to implement conservation programs to reduce regional demands. How the utility is addressing climate change: Applied research has been a hallmark of Tampa Bay Water's climate change engagement for over a decade. Working with local, state and national partners, the agency conducts assessments of the risk of climate change on its ability to provide drinking water for its members. In 2010, Tampa Bay Water joined the University of Florida's Water Institute to co-found the Florida Water and Climate Alliance, following the WUCA model. By leveraging staff expertise, along with hydrologic and systems models developed in-house, the agency conducts climate change impact assessments and develops adaptation strategies. Tampa Bay Water recognizes the importance of conducting impact assessments holistically by engaging local and statewide partners. Current efforts include understanding changes in precipitation amount and patterns on source water availability and timing. It also involves understanding the impact of rising temperature on evapotranspiration and resulting wetland and lake levels that are tied to groundwater use permits. The agency actively participates in the Florida Water Climate Alliance and the regional Climate Science Advisory Panel, which is working to build a resilient community and plan for sea level rise impacts on the Tampa Bay region's infrastructure. In addition, Tampa Bay Water is leading an effort to increase regional water use efficiency by promoting programs such as Florida-friendly landscaping and by disseminating applied research on efficient outdoor water use.